Architect's sketch for a proposed housing redevelopment project in downtown Saint Louis. This rendering was presented to the committee overseeing the project. Mayor Joseph M. Darst included this drawing in his official christmas greeting cards. 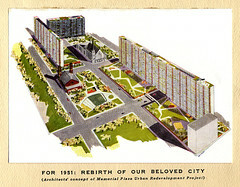 It was also Published in the Saint Louis Post-Dispatch (page 1, "Everyday Magazine") on Friday, December 1, 1950 with the headline: "Plaza Development Envisioned on Mayor's Christmas Card". "This design, prepared for the Mayor as a suggestion by George Hellmuth Associates and Harris Armstrong, shows three 24-story, narrow apartment structures containing 1,225 apartments. One (at right), on south side of Olive street, would extend between Fourteenth and Sixteenth streets, bridging [over] Fifteenth street. Another (left) would run along the north side of Chestnut street, between Sixteenth and Seventeenth streets. The third (rear) would bridge Pine Street on the east side of Seventeenth. Remainder of the area would be landscaped above underground garages. . . . This design is not binding on the new corporation but was meant to show the monumental possibilities of its undertaking."